After the declaration of CA results, less fortunate students start preparation again and the journey of CA Cracking begins. CA Exams November 2018 are coming close, hence CA aspirants of Inter and Final have started searching for CA Final important questions or CA IPCC Important questions for Nov 2018. Here, in this post on CAcracker, we have collected various perspectives for the important chapters, questions and tips for the CA November 2018 examinations. As per the common conception, you can not predict what will come in CA exams, but there are certain tips or tricks regarding examination about important chapters, time schedule can really help and make you to crack CA examination easily if you properly do follow our tips with smart work. So here I am presenting useful tips regarding IMP chapters. Most important chapters,topics & tips for CA Intermediate/IPCC, Final May 2018 exam. Follow tricks, the suggestion for last day/night preparation for May 2018 exam. Hope it will help you. In this subtopic, all the important tips for IPCC are gathered. First of all, you should check out the complete applicable syllabus for Nov 2018 exams, check it at CA IPCC Syllabus for Nov 2018. Third, Important Topics are hereunder. -comm. (deeds r very imp.) n comm. -Business proff. (thz sec r d most imp. viz sec 32, 40A2 ,40A3, 43B & topics like deduction in case of scientific research, writing off of preliminary exp., quest. related with book profits n cash payments in excess of 20,000 n payments that can b made n claimed till ROI filing date ie d above sections mentioned)…don’t leave this chapter FCAs plz, it’s coming for 16 marks since May’10 in every attempt. *From Service tax, 25 marks is asked from past few attempts, so it should be done properly. In the VAT they asked only a 4 marks question, so just practice few sums of VAT 7 you are done. 200 300 500 series SAs r imp. PM is enough to enough to do good preparation and get at least 50 marks in the paper 7, so just read the practice manual 2-3 time. So, don’t miss these important topics for CA IPCC exam. Chances of asking for above topics are high. These IPCC important questions Nov 2017. I am starting with the last paper of IPC/IPCC examination because this is the subject where lots of the students get struck and are failed. So I would suggest you to follow my steps to crack this subject with good marks. in IT SM subject, from practice manual 45 to 50 marks paper will be definitely asked because questions are repeated each time, so you should concentrate on that if you have less time. SM Tip: Start SM preparation from last chapter to first chapter. Do Practice Manual first as if once you do it around 60-70% course will be covered. From Practice Manual its quite easy to read topics as they are given question format rather than paragraphs as given in modules. And generally questions get repeated, so prepare those questions thoroughly and you will definitely score in subjects. Now start reading from Chapter 7. You can read from the module as its language is easy. Do all chapter end questions from module because true & false many times comes out of it. So better to go through that. And there are sometime 4 marks filling the blanks, so for it, just go through the quoatation given before starting the chapter. Just go through past papers, you will find those one liners in the form of filling the blanks. You have to read every concept in income tax paper & one more thing is total income problems are important, and in every problem you have to make note points, it will impress to valuationer. In taxation paper preparation for day before exam, start VAT & Service Tax. VAT is easiest topic just read it properly and do practical questions also. After reading from book in last just go through the Practice Manual. >In service tax do properly as there are lots of amendments and please do buy new Practice Manual of Tax from ICAI Branch and do all questions properly from it I am sure there will be many questions straight away from Practice Manual). As you know Service Tax & Vat portion covers 50 marks. >Then come on Income tax portion, start from Business & Profession head, then Capital Gain, then House Property , Salary & other Sources. Later than this do the small chapters, like deduction from GTI, TDS, Set off & Carry forwards etc. >Put the currency symbol other wise u can loss marks. >My sincere advice is don’t start with total income problem in examination because its take more time for completion. 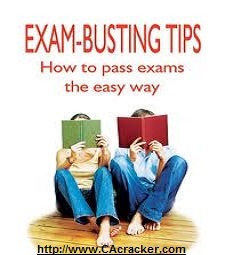 First thing first: Before reading CA Final Tips, I will recommend you to get CA Final Study planner & Tips. Here below I have gathered certain important chapters which are asked in every attempts with good weightage. I have also given the name of Authors whom reference books to be preferred for CA Final examination preparation. So check them out. d. Miscellaneous chapters are not at all misc in importance. They are asked of 16 to 24 marks and beauty is they are far easier and less complicated in nature. Must not ignore them. E.g. Nov 11 paper. e. As for last 3 parts I am sure all of us do so much practice that sometimes we can even solve that entire sum without question in our sleep. 1) Theory( chap: all chapter module theory especially 1,8,10,11). i. Theory is always good scorer as being in practical paper. ii. For the above practical chapters I’ll definitely say make concrete base of concepts and you’ll crack the paper. iii. AS I’ve seen the area which is most twisted in paper comes generally from chapter 2, 5,12,7. Brush up time value of money as it comes everywhere. a. For professional ethics I would only say mug up the clauses line by line. As it’s our act the language must be same. b. Paper presentation plays important part. Must underline all the clauses sections and SAs and have a neat presentation. c. Many case studies in areas of Co Audit and Professional Ethics are repeatedly asked so do refer all the material of institute. a. Personal advice: Munish Bhandari. b. Don’t ignore 30 marks portion of allied laws. It’s of same importance too. c. Cross out repeated asked cases in Bhandari so you’ll have less burden at last moment. d. Read the analysis given for each topic. You’ll come to know the weight of topic. e. Must compress material for last day. Or you’ll be lost in what to do and what not to do. 2) Budgeting and other material related topics( ABC,JIT). b. Be ready to read long description with lot of accuracy. c. Checking the solved part of question and underlining the figures will be of immense help. d. In Qt there’s trend of asking “ulta” question which are always easy but due to lack of practice we get scare and not even attempt that some time. But if you are to solve that at home you’ll find it too easy. So never freak out when such questions are there in exam. e. Theory is always of 33 to 40 marks having very less to read as compare to those long questions. f. Be ready for any kind of questions. Nov 11 final exam question is classic example of conceptual question where transfer pricing and other many questions were of concepts and not of numerical. a. Must refer module only for reading this subject. Also write same language. b. Have habit of reading ISCA theory in question answer format like that given in PM. Cause most common problem that I’ve heard is “Yaar sub kuch pada tha but question samaj me nai aya to answer kaise likhe.” So to answer best have a habit of reading in such format. 2) Assessment of different assesses. 3) 5 heads of income. a. Must do wealth tax, with assessment theory and in depth. They might not ask full sum instead in past 2 years they asked small questions. b. The syllabus in 99% case never going to be completed if you are giving ISCA and having only 1 holiday so must plan LMR on hour by hour basis. And even if you can’t complete whole syllabus no need to freak out cause everybody is in same boat. d. Amendments are “must do” thing. b. Must do institute’s case laws(asked of 16 marks almost every time). c. In case laws it’s not necessary to remember assessee name but if you want to you can do this, read whole case and wherever assessee comes replace it with the name. in this way you’ll remember it. d. In practices do not forget to write notes. e. Do refer practice manual. Cause many things are asked from that. That’s it for the tips or tricks for important chapters for CA IPCC and CA Final Nov 2018 CA examination. Remember… we work with a logo to give you tonic for cracking the CA exams with ease.. Enjoy !!! Share our post: “Most important chapters,topics & tips for CA Intermediate/IPCC, Final Nov 2018 exam. Follow our tricks/tips & suggestion for last day’s/night’s preparation” with your friends. Be our FB fan for more future useful updates. !!!! please update cma final new syllabus june 2014 examinations important quesitions &topics as soon as possible. sir i wnt imp topics of info tech for nov 2014….. Excuse me, Can i ask a doubt?? Ipcc Paper 7, Portions changed completely and still u have posted internet, dbms n all as important topics… how funny….!!!!! i am appearing for group2 in may 2015 and hav not read anything..what shud i do..? Sir,Can you Tell me how can plan now to study group 2 for may 2015. Sir, am a fresher and don’t know much about how to make a suitable plan for my upcoming IPCC MAY 2016 ATTEMPT. This time 1 question will definitely be from factoring topic. Can you please tell me what is chap 9 n 10 in ISCA?? and where is wealth tax in DT???? how long you people keep posting old stuffs and fool people here??????? only the title is changed for each term… inside contents remain the same….